Not long ago, my family and I traveled out of state to attend a relative’s funeral. We stayed at a hotel where, among other things, we started our morning with the hotel’s continental breakfast. Prominent among the offerings was a setup for making Belgian waffles, with batter and a large waffle maker. We decided to make a waffle and split it among our family. It’s been years since any of us has had anything but a frozen waffle from a toaster oven, and we were all surprised by how good a freshly made waffle is — a Belgian waffle, not less. It got us thinking how nice it would be to have our own Belgian waffle maker at home. Naturally, Aldi delivered. 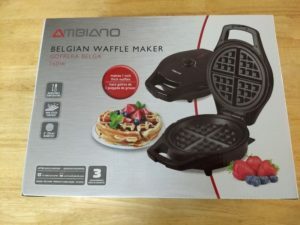 The Ambiano Belgian Waffle Maker, an Aldi Special Buy (ALDI Find), retailed for $14.99. That’s cheap. 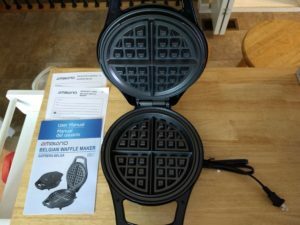 The waffle maker comes with the maker itself, a manual that includes some recipes, and warranty cards. Features include an 8″ diameter nonstick surface, adjustable temperature, and the ability to make 1-inch-thick waffles. All of this is backed by a 3-year warranty. The waffle maker appears to be made by Kalorik, a kitchen appliance company whose wares can be found in many big box stores, hardware stores, and online retailers. This waffle maker is similar to, but not identical to, a Kalorik branded Belgian waffle maker. The manual offers a few tips. Before your first use, you wipe it down with a damp cloth, dry it with a dry cloth, then plug it in and preheat. The manual says that some smoke the first time is normal, with the protective coat burning off, and after that it shouldn’t happen again. For each use, the manual also recommends brushing the grid with butter, margarine, or cooking oil, adding that a non-stick cooking spray is recommended for “best results.” From there, users should pour the batter evenly into the bottom plate, taking care not to pour it to the edges, as too much batter can cause it to overflow when it expands during cooking. Unfortunately, the manual doesn’t give much guidance on ideal time or temperature, so users will have to play with that for each recipe they use. On the subject of recipes, the manual does offer a few, although there are plenty of great recipes online, too. It’s worth noting here that Belgian waffles are a little different from traditional waffles: they tend to be both fluffier and crispier, and some people use yeast in their Belgian waffles, although you can get by without it. 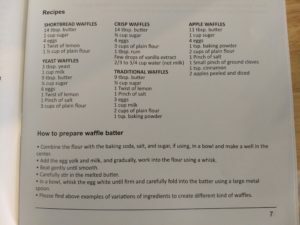 To test out the Ambiano, we decided to go with the traditional waffle recipe from the manual (we omitted the “twist of lemon” because we didn’t have any lemons or lemon juice in the house). After some experimentation, we found our best cooking setting to be the max heat, cooking 1 cup of waffle batter for about 3 minutes or so. That gave us waffles that were slightly crispy and golden brown on the outside while also cooked on the inside. The waffle was firm on the outside and fluffy on the inside. The waffles we made were not as crispy on the outside as the ones we ate at the hotel. 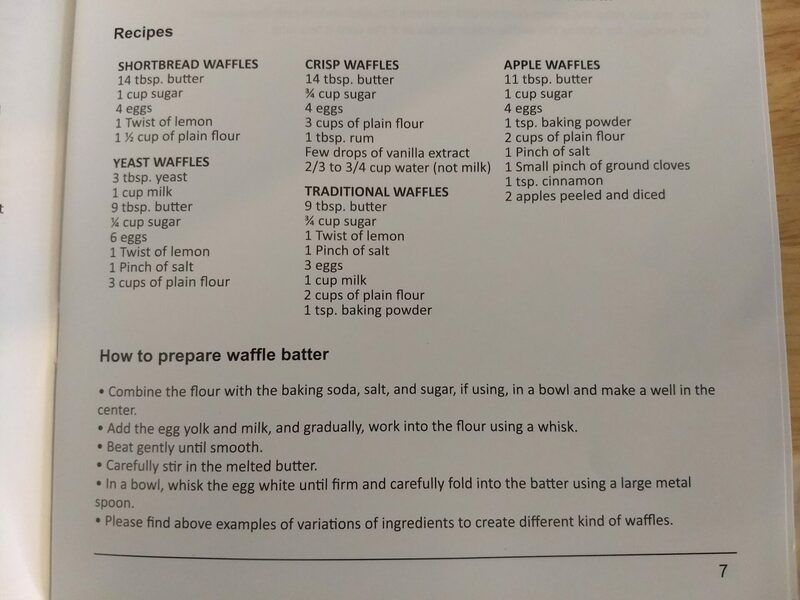 Still, the recipe in the manual was a solid one and the waffles were consumed quickly by the family. The recipe made about 3 waffles plus a little more, so keep that in mind if you’re looking to cook for a crowd. A couple of other notes. One, cleaning was easy. It wipes well, especially if you remember to spray cooking oil. If you like Belgian waffles — and we do — the Ambiano Belgian Waffle Maker is a nice budget model. It takes a bit of practice to get the hang of it, but it makes pretty good Belgian waffles, and for a fraction of the price of eating out or staying at a hotel. Worth a look. I got the square Ambiano waffle maker at Aldi yesterday. They were closing them out for $9.09 each. How could I pass on that?! I made waffles this morning with it and they were ok. It seemed a little slow and the back corners weren’t as well done as the rest of the waffle. But I’ll keep it and try other recipes. For now, I’d give it a 6 on a 10 pt scale.